New Zealand offers many outdoor activities and a Jet Boat ride is a must! 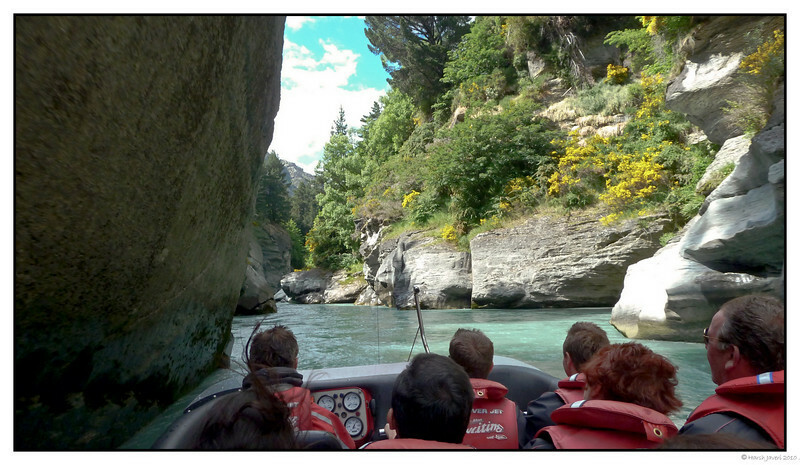 We took one such ride on Shotover river in Queenstown. The Shotover Jet boat goes at 85 kms per hour and needs only 5" of water to travel! The scenic and dramatic ride is thru narrow canyons with sharp rocks and pebbly riverbed just inches away! When the Jet pilot holds up his hand and makes a circle, you need to hold on tight as he makes a 360 degree spin!! A thrilling experience! They don't allow (encourage) still or video cameras as the ride is rather rough and WET! But have you ever heard of a Smugmugger without a camera? :) I stashed my Nikon away and carried the P&S Leica and shot some pictures and a bit of video too. It was quite an experience to shoot with camera in one hand while holding on to the bar with the other! You can view one clip at link below. Beside the speed, check out how close he takes the boat to the shallow edge! Great photo! You have put me in the scene! Looks like fun, and what a gorgeous place! Wonderful shot - especially as you were hanging on with one hand whilst shooting with the other! The photo gives a marvellous idea of how spectacular the gorge is there and I had a look at the video too. Wild! Great shot, sounds like a blast! That had to be an incredible experience! Wow, those boat captains are talented. Looks like fun. I've ridden in one of these on the Colorado River at the end of the Grand Canyon. Glad you had your camera because this is beautiful!